Lorrie knits and sews: I never saw a purple cow.. 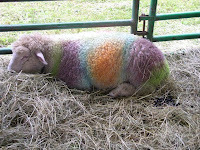 But I did see a rainbow sheep. 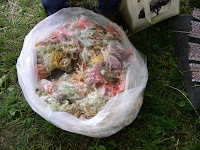 I was at Woolfest at Lake Farmpark, teaching knitting. I had a lunch break to visit the vendor area. There were cute llamas. There was roving and other spinning supplies. I don't spin! There was hand dyed yarn, but I have so much yarn. The sheep was picture worthy. Two sheep were dyed with Kool Aid, and one was sheered. If this were a sheep to shawl competition (it's just a demonstration), the dye would need to dry before carding and spinning. There isn't time in competition conditions to dye it the same day and have it dry. I saw a carder, two spinners, and a weaver, all Farmpark employees. 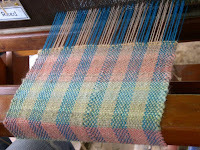 The weaving looked like this. The teaching went well, only 3 students per class, so they got person attention. 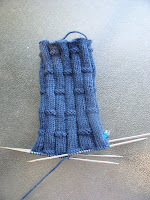 I taught beginning cables and using two hands to knit two colors. Came home to update the class description and make some minor changes to the handouts. While the students worked, I knit on the next birthday sock. I messed up the heel decreases and started again after lunch. There was less talking in the afternoon and more concentration. Today I got to knit in reverse again. The foot was too wide, so I decreased some more. The yarn is Kroy 4-ply and is thicker than a lot of sock yarn. I'm calling the pattern Bamboo.